Whenever we come out with new stencil patterns, as we recently did when we added some beautiful new stencils to our Indian Stencils Collection, we always have fun putting them to the test with some simple stencil finishes to inspire you. Read on to see 3 easy (and one unusual) ways to use these pretty new designs! The Annapakshi Indian Damask Stencil is an original stencil pattern based on India’s mythological white bird that is believed to live in heaven. It represents purity, prosperity and beauty. We love it so much that we have it available in three sizes. The mystical Annapakshi resembles a peacock, so we decided to interpret the medium-sized version of this new Indian stencil design in regal peacock blues! As we carry the full line of Chalk Paint® decorative paint, we often use it in our studio projects. For the background color shown here, we mixed equal parts of Florence Chalk Paint and Provence Chalk Paint and rolled on two coats with a foam roller. The stenciling itself was quickly done with Napoleonic Blue Chalk Paint using our new 3″ Super Large Stencil Brush. This stencil brush works amazingly well with both Chalk Paint® AND our Royal Stencil Creme paints. The brush allows you to stencil an allover pattern just a quickly as using a foam stencil roller, but with the advantage of more precision and less chance of stencil “bleed-under”. 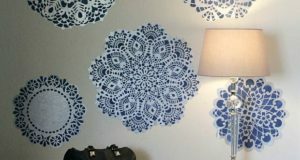 To stencil a feature wall like this, first measure and mark the center of the wall so that you can begin by centering and stenciling a full repeat of the pattern there. The Annapakshi Damask Stencil is a “half drop” pattern, meaning that the repeat of the pattern drops down halfway from one vertical repeat of the pattern to the next. In order to repeat this pattern correctly, you need to skip back and forth from one vertical row to the next. The registration “windows” in the stencil make it easy to get perfect alignment, and you can double check with a small level periodically to make sure that you keep your pattern repeating correctly. Our new Rani Indian Paisley Damask Stencil pulls it’s iconic motif from a vintage sari pattern. For this pattern we wanted to interpret the intricate and delicate look of henna (known as mehndi in India). Henna patterns are traditionally drawn on a woman’s hands or feet using a temporary plant-based dye. 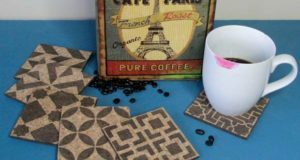 The steps for using a stencil for this technique couldn’t be more simple or straightforward; simply trace the pattern with a brown Sharpie! We CAN pass on some words of wisdom for this stencil tracing process though… Tracing a detailed pattern like this Indian stencil can be very time consuming, so we recommend limiting this stencil technique to a smaller wall space. 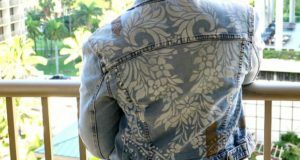 You could also stencil with a Sharpie, or other type of permanent ink pen, on fabric or even furniture for a very cool, unique look. In fact, we recently shared a fun Henna Inspired Tee Shirt project on our Paint + Pattern design blog here that uses specialty fabric markers called Tee Juice Pens. To showcase our Large Annapakshi Indian Damask Stencil we turned to one of our favorite stencil techniques, the Drop Shadow effect. Rather than stencil the Annapakshi Damask here as an allover pattern, we used this large-scale design as a single focal point motif on a bright pink wall. This is an easy stencil technique that just LOOKS complicated. To achieve it, you simply stencil the design first using Flat Black Royal Stencil Creme. Then, shift the stencil up and to the right diagonally about 1/8″. Stencil it again with a 1:1 mix of Antique Gold Stencil Creme and Bright Gold Stencil Creme. The result is a cool dimensional look where a black “shadow” drops under the pattern and gives it a large dose of POP! Please feel free to browse the entire Indian Stencils Collection for more ideas and ways to use these designs on walls and furniture. 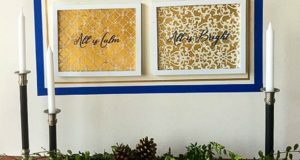 Remember that we always welcome YOU to share your Royal Design Studio stencil projects with us (and the world!). You can email pictures to projects@royaldesignstudio.com, or better yet, post them on our Royal Design Studio Facebook Page!